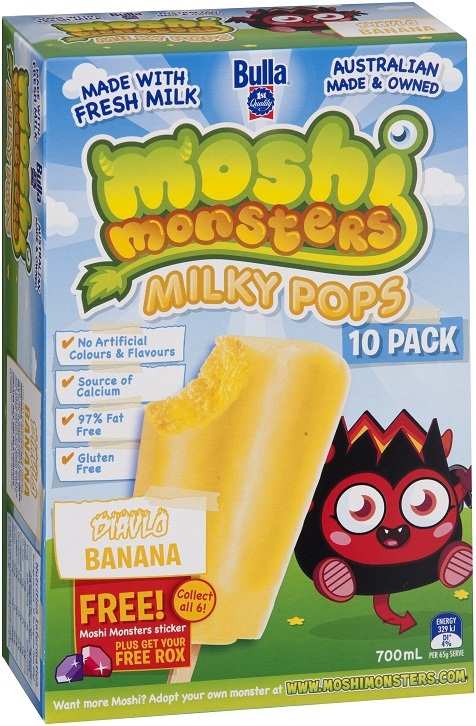 New from Bulla are Moshi Monsters Milky Pops and Fruity Pops – a range of frozen dairy and fruit based products for kids aged 5 -12. With 1g or less of fat per serve and free from artificial colours, flavours and gluten, the Moshi Monsters range is a healthier alternative to some popular ‘red’ snack products. Moshi Monsters come in four popular flavours (Chocolate, Banana, Tropical and Appleberry), all of which are great for kids to enjoy as part of a healthy balanced diet. The Australian owned and made range is available in a convenient pack size and is an ideal choice for busy school canteens. Want more Moshi information? Log onto www.bullacommercial.com or contact freecall 1300 134 882.